About this 1 1/2 Poker Chips: These 11.5 gram poker chips are the same size and thickness as casino chips, but are stronger, as they are made out of an ABS composite material. They come in a variety of colors and feature a dice illustration along the edge. Minimum order per item color is 500 pcs. Customize with your brand name or logo to hand out at charity events, fundraisers, casinos and more! A Fun Novelty ABS Composite Material Pad Printed 10 Available Colors Genuine Poker Chip These poker chips are the same size and thickness of standard casino chips and feature dice around the border. Excitement of Possibility Poker chips represent more than money, they invoke the excitement of the casino and the possibility of winning big. Great for Contests If you have a contest or a raffle, poker chips make great tokens to represent someone's chance of winning. Host A Poker Game Hosting a poker game with branded chips can make for a great company activity with employees or valued customers. NOTE: Product comes with Prop 65 warning label when shipped to California. Label reads: "WARNING: This product may contain carcinogen, which is known to the State of California to cause cancer. For more information, go to www.P65Warnings.ca.gov. About this Creative Large Snake Puzzle:Brain teasers like this large snake puzzle make great promotional giveaways. Your customers will appreciate the challenge this puzzle offers. A hit at conventions, trade shows and events. Take advantage of the promotional potential this has and give away these large snake puzzles. Not only a boredom breaker but a stress reliever too!Products are not intended for use by children or pets. They may present a choking hazard to children under 3 years of age.Special Instructions:Rush order: Information received after 12 noon Pacific Time will cause the order to move to the next day production. About this Fidget Cube:An unusually addicting, high-quality desk toy designed to help you focus. Fidget at work, in class, and at home in style. Fidget Cube has six sides. Each side features something to fidget with: Click, Glide, Flip, Breathe, Roll, Spin. Can be used at the office, while commuting, in class, while studying, in a meeting or while watching TV. NOTE: Product comes with Prop 65 warning label when shipped to California. Label reads: "WARNING: This product may contain carcinogen, which is known to the State of California to cause Cancer, birth defects or other Reproductive Harm. For more information, go to www.P65Warnings.ca.gov. Free ground shipping to any one continental USA location only. For any other additional locations or non continental USA locations please call for a quote. About this Plastic Round Spring Thing:Round plastic spring-like coil toy that travels down stairs for hours of fun. Available in a variety of solid colors or in rainbow. About this Rainbow Coil Spring:Don't let your business "slink" by! Give your next promotion a splash of color with these customized walking, spring toys! This rainbow colored coil is made of plastic. A classic toy for all ages it makes a great marketing tool for day care centers, waiting rooms, schools and more! About this Icon Mental Block:Six imprints for the price of one. Color combination may vary from the picture shown. Manufactured By Leeds. Note:Instructions Included: No. Materials: Wood.Special Instructions:Other imprint methods/areas may be available; please call for details. Please note that product images may not depict the standard imprint method included in pricing. About this Mini Drone:The Mini drone is pocket size but demands attention.The remote control doubles as a carrying case for your min drone.Making it easy to carry from point A to B.Simply charge the drone and your fun begins.Capable of flying up to 250 ft. on a single charge.Material: ABS Plastic.Special Instructions:Other imprint methods/areas may be available; please call for details. Please note that product images may not depict the standard imprint method included in pricing. About this Mind Trap 3D Puzzle:Set includes 7 puzzle blocks and a cloth carrying sack. Instructions are printed on the sack. Leed's products are not designed for use by, or intended for children ages 12 and under.Note: Instructions Included: No Materials: Wood Related Search Terms: PuzzleSpecial Instructions:Other imprint methods/areas may be available; please call for details. Please note that product images may not depict the standard imprint method included in pricing. About this Lifestyle 7- in -1 Desktop Game Set:Set includes game boards (on both sides of the lid) and game pieces for checkers, chess and backgammon, 28 dominoes, cribbage board and pegs, a standard deck of cards, four dice, and an instruction booklet. All components store neatly in wooden case. Note: Leed's products are not designed for use by, or intended for children ages 12 and under. Instructions Included: No. Materials: Wood. Related Search Terms: Game Set Special Instructions:Other imprint methods/areas may be available; please call for details. Please note that product images may not depict the standard imprint method included in pricing. About this Perplexia Master Pyramid:Unique brain-bender that requires assembling solid wood blocks into a three-dimensional pyramid. Includes solution manual. Manufactured By Leeds. Note: Leed's products are not designed for use by, or intended for children ages 12 and under. Instructions Included: No. Materials: Wood. Related Search Terms: Jigsaw Special Instructions:Other imprint methods/areas may be available; please call for details. Please note that product images may not depict the standard imprint method included in pricing. Thank you Summer and Paige for your reviews. We're glad to read how well our playing cards are. This is definitely a hit with many customers! Our Playing Cards In Case are fun for any card player. 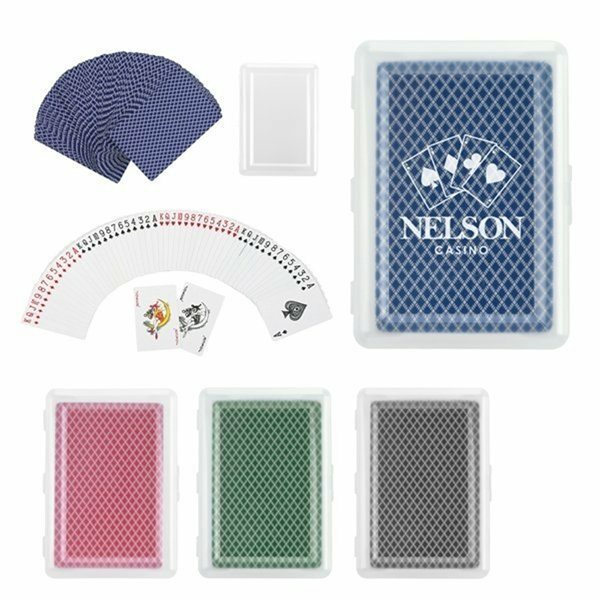 Get your customers to play with your branded playing cards! Thank you for your positive reviews Elizabeth and Phillip! We're glad to read the bears look great! We know this is a top seller because of how adorable these bears are! With over 1000+ games and toys available in our selection, you'll find the perfect toy to have fun with! Represent your company with a fun promotional toy! We have Rubik's Cubes, beach balls, Jenga, snake puzzles, slinkys, nutty putties, plush bears, bean bag buddies, plastic footballs, rubber ducks, stress relievers, decision makers, and more! Place your company logo on one of our promotional games & toys. Have fun watching your customers play with the option you select! Promotional games & toys are great for everyone, even adults! Choose the perfect option from our wide selection! Look through our selection of games & toys. Shop here! Our custom game and toy products are quality-crafted and made durable. Each eye catching piece is specially priced and professionally imprinted to vividly promote your brand long after they are handed out. Let’s make marketing make sense! It’s all about fun in our huge selection of promotional game and toy products. Check out these must-have game and toy gifts on sale now! Take a sneak peek at our stock of awesome promo game and toy items currently available. Feel free to give us a call, and we'll help expedite your order! Promotional games & toys are fun to have for any event! Give them away to any toy lover of all ages! Entertain your customers with a toy or game in our selection! We have many options available in our selection for games & toys. You don't want to miss out on a fun marketing tool like this one! Our featured list of games & toys are trending in this category. Look for the best option that fits your marketing needs.